Friday we made it... last weekend I couldn't attend the Soweto Wine Festival cause (9-5 yeap I work on weekends also), I really wanted to attend the event for my Around Soweto feature, but you know what I will just do this post cause I really wanted to go and (ngiyafoster). Soweto had it's 12th Annual Wine Festival, what!!! this has been going on for more than 11 years... I'm really impressed. As neighbours, Lynn Woodward and Mnikelo Mangciphu with two friends, sipped wine with their inyama, they dreamed about bringing wine to Mnikelo's home town of Soweto. Only a year later these neighbours came together once again but this time as founding partners of The Soweto Wine Festival. Cape Wine master Marilyn Cooper joined the team and they were off and running. Wine is one of the most appreciated and iconic South African products. Loved and laboured over, grown from our very own soil, it seems only natural that quality South African wines should be (responsibly) enjoyed by all. That's why, 12 years ago, the Soweto Wine Festival kicked off with the vision of sharing this proudly South African product with the Sowetan audience. 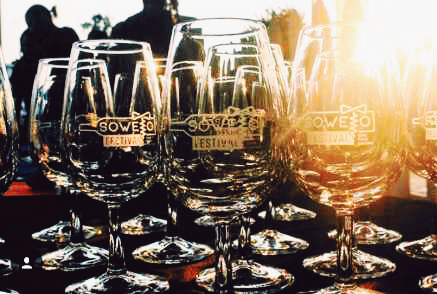 Today the festival has grown in scale and scope and attracts thousands of local visitors and internationals alike to the festival and surrounding streets of Soweto for a weekend and #72HOURS of exploration and celebration of proudly South African wine, music, and food culture. So there you have it, next year I will make sure I cover this event. I hope that you will be there with me also. A wine festival sounds right up my street!